In search of the best professionally captured video production services in Southern California? Jonathan Dannenfelser — otherwise known as “Jonathan The Drone Guy” — has established a worthy reputation over the years for providing expert video production services in the greater Los Angeles area. He’s worked with Grammy award-winning artists, high-end realtors, TV personalities, successful business owners, professional sports stars, couples-to-be, and other types of people to turn their vision into a multimedia reality. As an expert drone pilot, Jonathan’s passion for drone photography and videography in Los Angeles drove him to obtain FAA certification, licensing, and bonding in order to extend his talents to help foster people’s creative ideas. 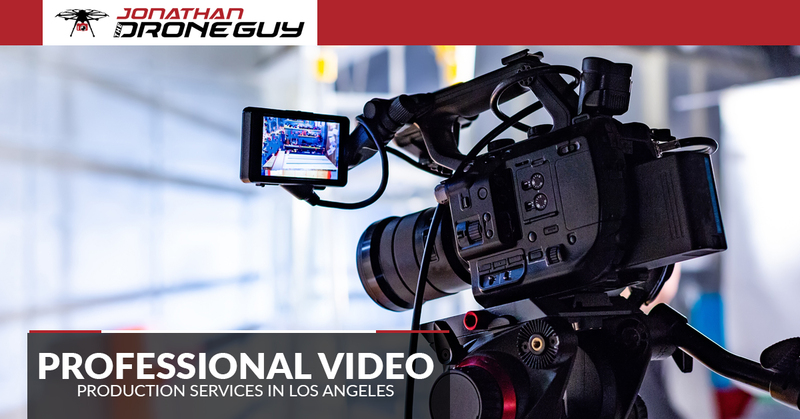 With a rich network of connections in Southern California, his professional video production services ensure that your project is captured with quality in mind. From 8k video production and beyond, Jonathan and his team can do it all. Real estate photography is old news. Prospective buyers want a complete virtual tour of a property, and Jonathan’s video services for realtors captures homes and businesses for sale in a professional and appealing light. Married couples will want to remember their special day for the rest of their lives. This means that their wedding capture needs to be perfect down to every single detail, and Jonathan’s wedding video production services can make it happen. Need help shooting your latest music video? Jonathan has a keen eye for detail and natural creative abilities that will help turn your conceptual ideas into a final product that you’ll love. If your video is to be aired on a major network or on the big screen, Jonathan’s access to high-quality professional camera equipment means that you’ll be putting forth the best deliverable possible. For many businesses from small startups to large corporations, client testimonials are a key way to foster trust between the company and prospective customers or new clients. Jonathan will help capture your company professionally, without any mistakes or misrepresentation. Jonathan will professionally film your business with an end product that owners will be excited about. To get your inventory out on the market and advertise, video is the ideal medium. Jonathan has extensive experience shooting video for car dealerships. Though games are best experienced live, there are a number of reasons to film the event for future viewing. Jonathan has a trained eye for following the center of action when he shoots video for sporting events. It’s Your Creative Vision. Let Jonathan Help You Bring It To Life! With the help of Jonathan The Drone Guy’s professional video production services in Los Angeles, you’ll get the capture that you want with the budget that you deserve. Get started by contacting Jonathan today!